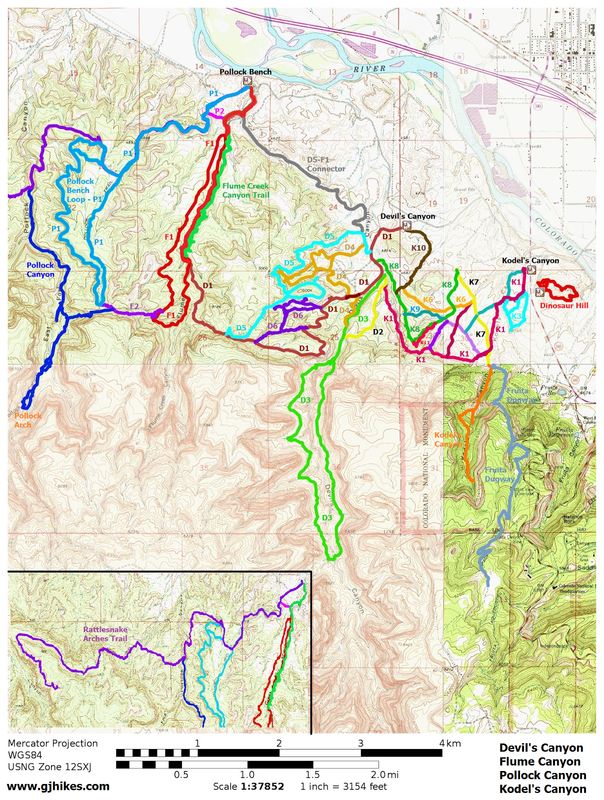 The F2 trail is located in the Flume/Pollock Canyons Area of the McInnis Canyons National Conservation Area near Grand Junction and Fruita, Colorado. 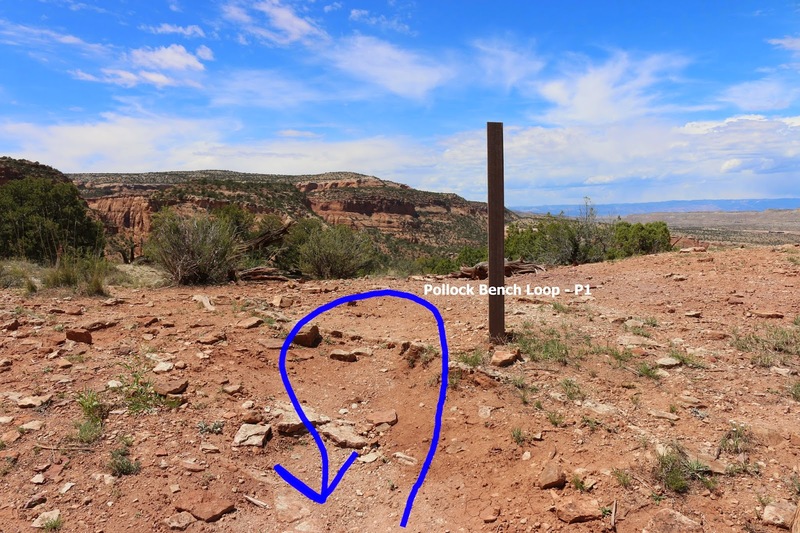 The trail follows a section of the Old Ute Indian trail that connects the Flume Canyon F1 trail and the Pollock Canyon P1 trail. 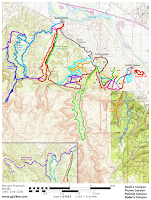 The entire length of the trail lies within the boundaries of the Black Ridge Canyons Wilderness Area. This post begins at the 2.4 mile point of the F1 trail and follows the F2 trail up to Pollock Bench and then back to this same point. As the F2 trail departs from the F1 trail it works its way along the side of the hill to get around a nearby wash. Eventually the trail crosses the now shallow wash and continues up the side of the mountain. At this point the trail continues climbing at a moderate slope with an average grade of 15% gaining over 300 feet of elevation in just over a half of a mile. Just like most of the rest of the Old Ute Indian trail this section is secluded from view from the valley below. A well balanced hoodoo attracts the gaze of passers by. This is average fare for the scenery throughout the McInnis Canyons area but it never gets old looking at it. From time to time deer can be spotted taking advantage of the easy route the trail provides. On this day all we saw were the fresh tracks of a doe and her fawn. The trail levels off near the point that the unmarked Pollock Canyon trail connects on the left. After that there is one more climb to make to get the rest of the way up to Pollock Bench. 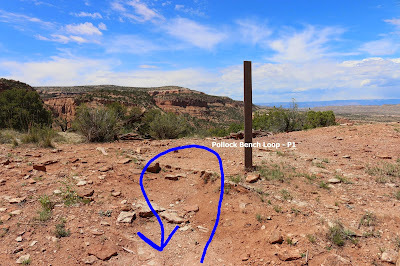 For this post we turned around at Pollock Bench and headed back down to the F1 trail. There are even more enjoyable views traveling in this direction. Most hikers will probably use the F2 trail to create a loop out of the P1 and F1 trails rather than hiking it in both directions as we did. That is what was required though so that we could post the trail on the website. We have known about the trail for a lot of years but we are just now getting around to adding it. It is always nice to hike a trail that has been around for hundreds of years. You can almost imagine a band of Indians using the trail to pass through the area without being seen. If you would like to see it for yourself then all you have to do is 'Take a hike'.